Shopping for Mickey Mouse Statues? Inspired by the animated short, "Thru the Looking Glass," Mickey Mouse deals the winning hand in this colorful design! 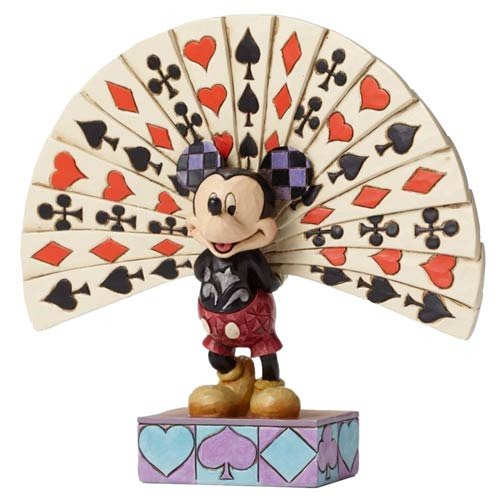 Featuring artist Jim Shore's signature combination of quilt patterning and unique folk art design, Mickey fans out a colorful deck of cards from behind his back. Made of stone resin, the Disney Traditions Mickey Mouse All Decked Out Statue measures approximately 7-inches wide x 6 1/4-inches tall x 2 1/4-inches long. Ages 13 and up.